Shih Tzus are on the list of allergy-prone dog breeds. When your furry little Shih Tzu starts obsessively licking his feet and rubbing his face on anything handy, you probably have an allergic pup. The sweet little guy could be allergic to a number of things, so schedule a visit to the vet to pinpoint the cause and get treatment. 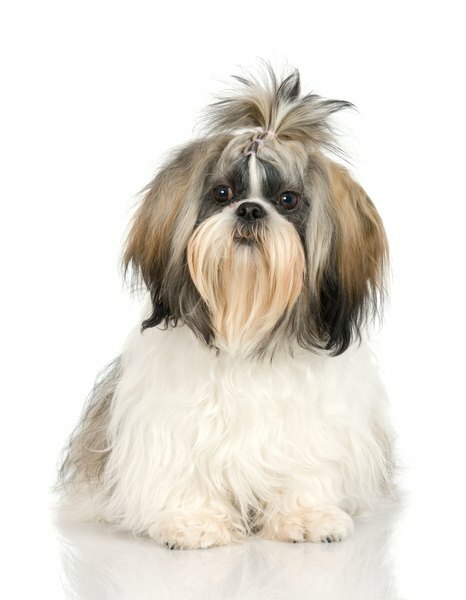 Because of the flattened face typical of his breed, your Shih Tzu may already have breathing problems. Additionally, while dogs of any breed can have allergies, your fluffy little friend belongs to a breed that is prone to allergies. Your buddy may have an inherited tendency to develop allergies, including inhalant allergies, flea allergies and food allergies. In some cases, an allergy may worsen the breathing difficulties, but allergies in dogs are far more likely to show up as skin problems. Your little pal may be allergic to the same kinds of things you are, such as airborne pollens, dust and molds, and even human dander. He could also be allergic to an ingredient in the shampoo you use to bathe him or the detergent you wash his blanky in. Such allergies to things in his environment generally will cause symptoms in your Shih Tzu like licking and chewing at the pads of his feet, rubbing his face, and incessantly scratching. Inhalant allergies may start as seasonal symptoms, plaguing your pooch only a few weeks during the year; but over time, they can begin to bother him constantly. Allergies can't be cured, but the good news is that your vet can offer ways to manage the symptoms and make your buddy far more comfortable. About 40 percent of dogs are allergic to the saliva in flea bites, and the sensitivities of Shih Tzus make your pal a candidate for membership in that group. If he's allergic to flea bites, a single flea can set off a reaction, so it's best to ensure no flea has an opportunity to bite him. Symptoms of flea allergy include scratching, chewing and excessive licking, with hair loss. Even after years of happy munching, your little guy's system may stop tolerating certain ingredients in his diet or favorite treats. The allergen could be anything -- wheat, soy, or the meat in his daily ration all are among the potential candidates. 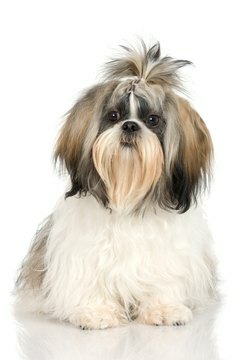 Signs that your Shih Tzu has developed a food allergy look at first much like the symptoms of other allergies. He might itch, scratch and have red skin; but food allergies also often cause digestive issues such as loose stool, diarrhea or vomiting. Consult your veterinarian if your Shih Tzu shows any kind of allergic symptoms. If the problem appears to be food allergy, your vet may put your little guy on a strict hypoallergenic diet to see if the symptoms will clear up over time. If the symptoms disappear, your vet may recommend some additional testing, such as adding ingredients back into your pal's diet one-by-one, to determine which specific ingredients cause symptoms to return. Natural Health Bible for Dogs and Cats; Shawn Messonnier, D.V.M. Vet Info: What Causes Food Allergies in Dogs? Vet Info: Are Dog Allergies Common? Can a Kitten Be Allergic to Its Owner?